[vc_row][vc_column][vc_custom_heading text=”Delta Children Universal 6 Drawer Dresser Review” font_container=”tag:h1|text_align:center” google_fonts=”font_family:Montserrat%3Aregular%2C700|font_style:400%20regular%3A400%3Anormal”][vc_column_text]If you’re looking for a changing table with storage then this 6 drawer baby dresser from Delta is one of the best changing tables with drawers for the price. This is a beautiful piece of furniture and will go well with any style or design your babies nursery room happens to be. And with it’s six very spacious drawers, you’ll have plenty of space for onesies and diapers. If you’re looking for matching furniture have no worries, Delta crafts all it’s furniture to coordinate with each other, so you’ll have no problem at all finding something that you really like. Take a look here at some other Delta baby furniture. 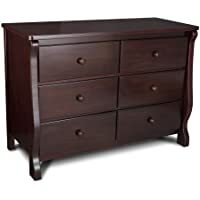 If you want to see how some of the top convertible cribs that would go great with this dresser compare to one another take a look at some of these 4 in 1 convertible cribs I did a comparison chart for. This dresser is a Top Seller and rightly so, it’s beautifully styled and looks great in any babies nursery room, and to top it off many people even use it as a changing table as well. Checkout my review of this product below and let me be perfectly honest right up front and admit I’m a bit biased. I just love the look of this little dresser and think it would look great in any room where storage is needed. Whether your decorating for a girl or a boy, this gender neutral nursery piece boast classy looking slightly curved legs giving it that cute little rough and tough sturdy little piece of furniture look. Which makes it just perfect for any child’s nursery, no matter the gender or the rooms design. This little piece is any rooms unsung hero, it’s small but has enough room for just what’s needed most. It’s also strong enough to put the most important things on top such as a baby or a flat screen TV. It has easy to grasp knobs on drawers that sport a durable metal glide system with safety stops that prevent the drawers from pulling all the way out of the dresser. I absolutely love this feature, I hate when the drawer comes out of the dresser and for some reason it seems to happen to me more on the smaller dressers. My bedside table is awful for doing this to me (or am I awful for doing it to my bedside table?) any who I can’t stand when it happens none the less. I don’t mean to pull it out that far, but sometimes it just happens and if I don’t catch it, it hits the floor and I hate when that happens. And the fact that this dresser has drawers that won’t slid all the way out is a great big ‘ol plus in my furniture for nurseries book. Don’t worry about the drawers not opening all the way either. As long as you install them correctly they open the full length of their depth and stop automatically once they hit the rollers. The drawers are about a foot wide by a foot long and roughly about 5 to 7 inches deep. The inside bottom of the drawers are not made with flimsy cardboard bottoms either. It’s a nice hard bottom that looks and feels like real wood. For the price, this is a very well make piece of furniture that will last for many years to come. Don’t limit yourself either because these dressers aren’t just for the babies nursery. You can add one any where you happen to be in need of storage space and you just don’t want to use any old ordinary type of storage. Use your imagination and put some classy style in any room. [/vc_column_text][/vc_column][/vc_row][vc_row][vc_column width=”1/2″][vc_row_inner][vc_column_inner width=”1/2″][vc_single_image image=”1937″ onclick=”custom_link” img_link_target=”_blank” link=”http://www.amazon.com/Delta-Children-Universal-Dresser-E%20spresso/dp/B0069209FY/ref=as_li_ss_tl?ie=UTF8&redirect=t%20rue&ref_=nav_ya_signin&linkCode=ll1&tag=sofaconsoletables-20&linkId=73becdd18c52025fead5263a25f7afc3″][/vc_column_inner][vc_column_inner width=”1/2″][vc_column_text]The beautiful classy Delta Children Universal 6 Drawer Dresser has 7 colors to choose from and is crafted to coordinate with all of the Delta brand’s cribs. [/vc_column_text][/vc_column_inner][/vc_row_inner][vc_row_inner][vc_column_inner width=”1/2″][vc_single_image image=”1748″ onclick=”custom_link” img_link_target=”_blank” link=”http://www.amazon.com/Delta-Children-Bentley-Dresser-Chocolate/dp/B0052SGBV2/ref=as_li_ss_tl?ie=UTF8&qid=1462664510&sr=8-1&keywords=Delta+Children+Bentley+Six+Drawer+Dresser&linkCode=ll1&tag=sofaconsoletables-20&linkId=151788fbf9791eef8577c9c676b22ce7″][/vc_column_inner][vc_column_inner width=”1/2″][vc_column_text]Another Delta product, the Bentley Six Drawer Dresser is a classy storage solution that will outlast trends and changing tastes as it grows with your kids. [/vc_column_text][/vc_column_inner][/vc_row_inner][/vc_column][vc_column width=”1/2″][vc_row_inner][vc_column_inner width=”1/2″][vc_single_image image=”1752″ style=”vc_box_rounded” onclick=”custom_link” img_link_target=”_blank” link=”http://www.amazon.com/Stork-Craft-Universal-Dresser-Espresso/dp/B00M42XCPW/ref=as_li_ss_tl?ie=UTF8&qid=1462665090&sr=8-2&keywords=6+Drawer+Universal+Dresser&linkCode=ll1&tag=sofaconsoletables-20&linkId=bdf3952f390caeb5087067d68805ee3f”][/vc_column_inner][vc_column_inner width=”1/2″][vc_column_text]This beautiful Stork Craft Kenton 6 Drawer Dresser is crafted to coordinate with any of Stork Craft beautiful cribs. Kenton combines classic styling & pure functionality that will grow with your child. [/vc_column_text][/vc_column_inner][/vc_row_inner][vc_row_inner][vc_column_inner width=”1/2″][vc_single_image image=”1750″ style=”vc_box_rounded” onclick=”custom_link” img_link_target=”_blank” link=”http://www.amazon.com/Fisher-Price-Drawer-Double-Dresser -Espresso/dp/B00DF6QDXE/ref=sr_1_2_a_it?ie=UTF8&qid=1462 664546&sr=8-2&keywords=Fisher-Price+6+Drawer+Double+Dres ser#productDetails”][/vc_column_inner][vc_column_inner width=”1/2″][vc_column_text]This Fisher Price double dresser is traditionally casual and fits perfectly in any nursery. It includes a decorative rail which can be added to the top to create a wonderfully classic antique look. This is a Beautiful Piece of Furniture that comes in many different colors and is Made of heavy hardwood solids. It comes with gorgeous Matching Furniture including a babies crib. Assembly is required however it’s very easy to put together.